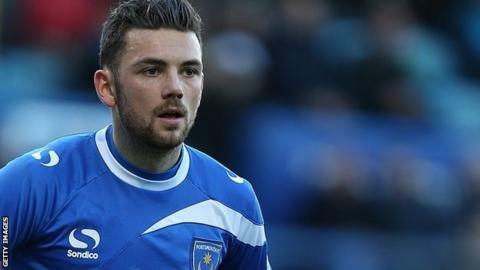 Danny East's early goal was enough to earn victory for Portsmouth and ensure Northampton remain in the relegation zone with two games of the season left. East struck after minutes, volleying over keeper Matt Duke from 10 yards. Sonny Bradley wasted a good headed chance to make it 2-0 while Emile Sinclair and Darren Carter missed decent chances for the Cobblers. The hosts dominated the second half but could not find a breakthrough and stay in the bottom two on goal difference. Northampton are level with Bristol Rovers and Wycombe on 47 points, who also both lost. Exeter are two points ahead after losing to bottom-of-the-table side Torquay United. "The run we've had has been absolutely fantastic and the players deserve massive credit for what they've managed to achieve in the last five games. "It just shows you how tight this league is. When we took over we were looking over our shoulders worried about the trap door, but thankfully that's gone away now and we can hopefully start to look upwards. "I didn't pick the team to make it easy for anybody and I felt that the right thing to do today was freshen it up and luckily it worked today. "I've got plans in my head in case I am manager here next season but there's no point going any further until I know what the situation is." Match ends, Northampton Town 0, Portsmouth 1. Second Half ends, Northampton Town 0, Portsmouth 1. Corner, Northampton Town. Conceded by Trevor Carson. Attempt saved. Kelvin Langmead (Northampton Town) right footed shot from the centre of the box is saved in the centre of the goal. Corner, Northampton Town. Conceded by Daniel Alfei. Nicky Shorey (Portsmouth) is shown the yellow card. Foul by Chris Hackett (Northampton Town). Ricky Holmes (Portsmouth) wins a free kick on the left wing. Attempt saved. Kelvin Langmead (Northampton Town) header from the centre of the box is saved in the centre of the goal. Ben Tozer (Northampton Town) wins a free kick on the left wing. Foul by Michael Drennan (Portsmouth). Gregor Robertson (Northampton Town) is shown the yellow card. Michael Drennan (Portsmouth) wins a free kick on the right wing. Attempt saved. Jed Wallace (Portsmouth) right footed shot from the centre of the box is saved in the centre of the goal. Corner, Northampton Town. Conceded by Nicky Shorey. Substitution, Northampton Town. Kelvin Langmead replaces Richard Ravenhill. Richard Ravenhill (Northampton Town) wins a free kick in the attacking half. Attempt missed. Ricky Holmes (Portsmouth) left footed shot from a difficult angle on the left is too high. Substitution, Portsmouth. Ricky Holmes replaces Danny East. Foul by Sonny Bradley (Portsmouth). Corner, Portsmouth. Conceded by Matthias Kouo-Doumbe. Attempt saved. John Marquis (Northampton Town) left footed shot from the centre of the box is saved in the centre of the goal. Ian Morris (Northampton Town) wins a free kick in the defensive half. Foul by Wes Fogden (Portsmouth). Trevor Carson (Portsmouth) is shown the yellow card. Evan Horwood (Northampton Town) is shown the yellow card. Richard Ravenhill (Northampton Town) wins a free kick on the left wing. Foul by Danny East (Portsmouth). Corner, Northampton Town. Conceded by Johannes Ertl. Attempt saved. John Marquis (Northampton Town) right footed shot from the centre of the box is saved in the centre of the goal. Attempt saved. Michael Drennan (Portsmouth) left footed shot from outside the box is saved in the centre of the goal.